The Eagle is a Film programme that first aired in 2011 and has been classified a 12 certificate. 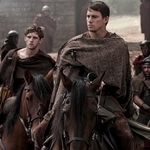 In 140 AD, young Roman centurion Marcus Aquila (Channing Tatum) arrives in Britain to command his first garrison. The son of the man who led the legendary Ninth Legion north into Caledonia 20 years ago, only for all 5,000 men to never be seen again, Aquila is determined to regain his family's honour by recovering the unit's emblem: the Eagle of the Ninth. Badly injured while repelling an attack by Celtic warriors, Aquila is discharged from the army and recuperates at his uncle's (Donald Sutherland) villa, mourning his misfortune. 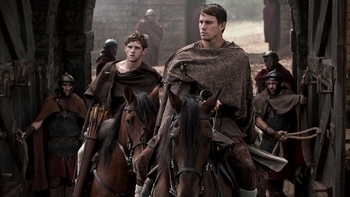 Saving the life of a locally-born slave, Esca (Jamie Bell), during a gladiatorial contest, Aquila's wealthy relative buys him the slave, who swears to serve the man who rescued him, despite hating the Roman Empire. When Aquila hears a rumour that the missing Eagle has been seen beyond Hadrian's Wall, the two embark on a reckless quest to find it. Out of his element, Aquila finds that he must rely on his servant to navigate the highlands, and as the pair come into contact with hostile tribes, their roles are reversed as slave becomes master and Esca's motives become increasingly ambiguous. Based on author Rosemary Sutcliff 's children's novel The Eagle of the Ninth, this boys' own adventure from the director of The Last King of Scotland is stirring stuff. Those who can overlook Tatum's 2nd-century Alabama drawl should enjoy the macho camaraderie he strikes up with Bell, a far more interesting actor who seems to specialise in acting leading man lunkheads off the screen. With stylish battles and beautiful cinematography that captures all the bleak beauty of the Scottish wilds, Kevin Macdonald's film seems to be caught between being classy historical fare and pulpy action movie fun. As a result, this Eagle occasionally feels like it's made out of lead rather than gold, but it's a handsomely staged and frequently entertaining romp nonetheless.